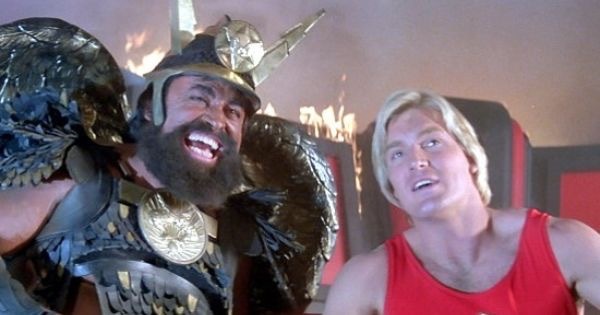 One of the guiltiest pleasures of my life is my love of the classic 1980 masterpiece ‘Flash Gordon’ starring the outrageously blonde Sam Jones, the tempting Melody Anderson, the debonair Timothy Dalton and of course Brian Blessed stealing the screen with his huge presence. For God’s sake! Strap yourselves down! Quick! One of the things I have recently discovered is that the film was part shot on location in the Isle of Skye – yes that’s right the runway scene at the beginning just before we discover that Flash hasn’t learnt to land a plane. The good news is that the runway is still there and although I understand its fallen into disuse you can still get on there and grab a photo while wearing your ‘fan favourite’ Flash Gordon’ T-shirt. Trust me – I’m filled with a deep sense of glee knowing that in just a couple of weeks I’ll be grabbing that photograph. Flying blind on a hawkman rocketcycle! Over to homing beam! Now why is my running blog going on about my favourite movie? Ah well that’s pretty simple, as some of you know I’ll be running the 74 miles from the top of Skye to the bottom during the Skye Ultra Trail running event at the end of May and I had this amazing dream last night where Sam Jones, Brian Blessed and other cast members presented the runners with their medals for running from one end of the island to the other. I think it also had Brian May giving it riz on guitar in the background as I crossed the line – what a dream. So here’s the thing, just if any of the cast/crew read this, if you happen to be passing Skye on May 28th/29th and wanted to eat some cake and say hi, if you happened to want to leave a message of good luck for the runners then that would be an awesome lift to those who will be battling (not Ming) the challenges of the Skye Trail and I imagine we would all jump up and down in joy. I realise I’m probably abusing my own blog but putting this out there but if you don’t ask you don’t get. The Skye Trail Ultra will be one of the hardest races I have ever committed to and especially as it takes place just five days after I will have completed the incredibly tough 80 mile Hillsborough to Anfield Run in memory of the 96 people who died at the Hillsborough Tragedy. Pathetic Earthlings! Hurling your bodies out into the void without the slighest inkling of who or what is out here. If you knew anything about the true nature of the universe, anything at all, you would have hidden from it in terror. Well I’ll be hurling my body into the void and while I might not know what I’ll be facing I’ll be hoping to invoke the spirit of Flash Gordon and make sure I save the day.